Important note: None of this is intended as investment advice - please do your own due diligence and make your own decisions on all investment matters! As a sometime investor, one thing of interest to me in doing this blog is discovering how different companies performed through the Depression. I don't believe the results are directly transferrable to today for a number of reasons, but I still think this gives some information that can usefully be applied to investing now. 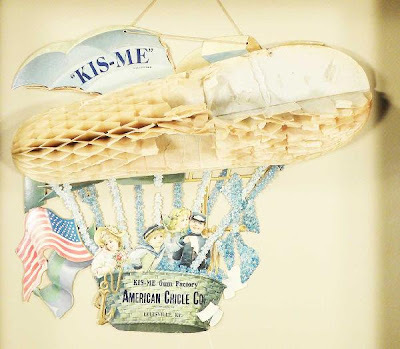 Today I'll be covering a company in what I'd call the small luxuries sector - American Chicle, which made chewing gum (brands included Kis-Me, Beeman's, Adams and Chiclets; (deep inhale) later acquired by Warner-Lambert in 1962, which in turn was acquired by Pfizer in 2000, which then sold its candy brands to Cadbury in 2003, which was in turn acquired by Kraft in 2010 (whew)). Earnings recovered rather explosively to $4.51/share in 1934 and $5.94/share in 1935. All in all, an extremely creditable earnings performance - I haven't been through too many of these cases yet, but I'd venture to guess it's in the top few percent of companies as far as maintaining earnings during those years (while earnings finally slipped in 1931-32, if we take into account the substantial price deflation in this period, along with the 15% stock dividend in 1929, I think 1932 earnings remained substantially above the 1928 level). At first look, this performance is a bit surprising - you'd expect people in a serious depression to concentrate spending on the absolute essentials, and as far as I know no one has ever died from a lack of chewing gum (or even suffered severe distress). It appears that, while people may cut out the big discretionary items in a depression, they might maintain the small comforts; in fact, they might even tend to use more of them. Another interesting thing to note is the two extremes hit by the stock price during the period covered above. First there was the eye-opening runup to over 81 during the 1929 euphoria; this brought the price-earnings multiple close to the “nosebleed” territory of 20. Second, there's the amazing drop in 1932, when the yearly low was 18. 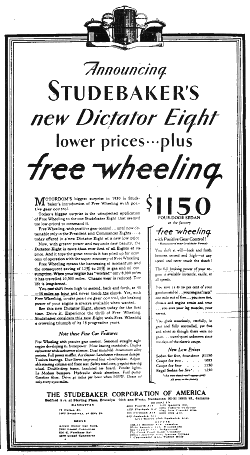 This brought the price-earnings multiple well below 5, and with an annual dividend of $3 including extras, the dividend yield obtainable at the 1932 low was 16.7% (gadzooks!) - all this for a company that had maintained earnings at close to record levels throughout the Depression (lest you think this can be explained by an unexpected collapse in earnings in mid-1932, the quarterly earnings per share that year were $.89, $1.05, $.90 and $.75; so the dividend continued to be earned through 1932 and was probably not in serious doubt at the time the low was hit in June; in my opinion, the explanation for the drop is much more likely to be found in the general sh*t-hitting-the-fan situation at the time). If, through careful analysis or sheer dumb luck, you find a company that can maintain or grow its earnings through a downturn, and buy the stock, it seems that you might most of the time be rewarded by a stock price that reflects that performance. That said, if you simply close your eyes and buy regardless of valuation on the theory that you should just buy good companies without trying to time the market, you may be vulnerable to painful losses - note what happened if you bought at the 1929 peak. What's a reasonable valuation is of course a tricky question, but working from this example and based on my belief that, in spite of all the serious issues and government blundering currently, things probably won't get as bad as in the 1930's, I'm going to go with around 10 to 12 times earnings as a workable starting point. “Sentiment in Toledo is better than at any time since the bank failures.” It's reported that least one of the closed banks may reopen reasonably soon. “But the city is not without its humorous incidents. On a big sign in front of a restaurant on Huron Street, this writer noted the following: 'For God's Sake Eat Here or We'll Both Starve. '” Plan being considered in Kansas City to distribute 10,000 - 25,000 free loaves of bread daily; flour to be donated by mills and grain cos.
[Note: Strangely Unfamiliar Dept.] Sen. Reed (R, Pa.) advocates “very heavy” inheritance tax to allow cutting other taxes; says “a man should not be allowed to leave his son and other ablebodied relatives complete immunity from work.” NY Gov. Roosevelt and state Republican leaders reach compromise on unemployment relief measure. US Atty. Gen. Mitchell charges states are abdicating some of their proper functions and asking Federal govt. to assume them. 1931 was an unusually active year for state legislatures, with 44 of 48 meeting in regular session. However, barring special sessions, the “legislative stages ... now will be dark” in all but 9 states for the next two years. British House of Commons approves 10% cut in dole after sharp attacks from Labor. “Semi-mutiny” by the British Navy demonstrates the current high level of opposition to the govt. 's budget cuts. Washington, DC will soon have the world's largest gas station to handle the traffic along Constitution Ave.; it will be 335 feet long and stand 6 stories high. Farmers and merchants of Lewis County, Wash. dined on a huge omelet fried in an 8-foot skillet at their annual picnic. It required 10,000 eggs; to grease the skillet, the chef fastened large slabs of bacon to his feet and skated about. Market wrap: Stocks suffered “steady liquidation” in the Saturday session on unusually heavy volume; however, “the decline was orderly,” probably due to low level of brokers' loans. Heavy selling in the final half-hour produced many new lows; “the kind of stocks under liquidation indicated that shares were coming out of boxes.” US govt. bonds steady while all other classes fell sharply, with many new record lows. Rail group again “disturbed” as all grades declined. High-grade utilities succumbed to the downtrend but showed smaller losses. Convertibles fell along with stocks. Foreign govts. came under heavy liquidation; British 5 1/2's, 1937 dropped 8 1/4 points to 93; German Int'l 5 1/2's fell 2 points to 38; French and Italian issues slightly lower; S. American issues pressured with many new lows. Grains sharply lower in spite of run of bullish crop news, including unprecedented drought in Southwest. Cotton fell to new season lows, hitting lowest levels in 32 years. Egg and potato futures hit new lows. Dow industrial average closed at a new bear market low; there were no new yearly highs and 320 new lows. Dow industrials are at the lowest level since 1925, and the rails the lowest since 1897. US Steel hit a new post-1921 low. Volume of 2.438M shares was highest for a 2-hour session since Apr. 1930. Considerable forced liquidation reported in the past week by individuals to pay off called loans. Recent weakness in bank stocks has led to rumors of dividend cuts, though “leading banking quarters” say most important banks are still earning their dividends. Insurance stocks fell sharply Friday and Saturday. After holding firm for a long time, Woolworth succumbed to liquidation last week; no change in co. affairs to account for the decline. M. Holland of the Nat'l. Research Council urged industrial cos. to more extensively use scientific research in order to stimulate industry and hasten recovery. Opportunity seen in good bonds due to “hysteria of the moment resulting from the workings of mass psychology.” Bonds also expected to benefit from relaxation of rules requiring nat'l banks to write off all bond losses, which is expected to check one of the main sources of recent liquidation. Stocks worked steadily lower, picking up momentum later in the week; heavy foreign selling of US shares reported. Friday saw most severe market breaks since early June. Dow industrials fell to a new bear market low, confirming earlier signal by the rails “that another phase of the primary downward” bear market movement had started; utilities also hit a new bear market low. Lowest levels in many years hit by majors including Steel, GE, and GM. Bond market “disturbed.” Railroad bonds sagged in both the high and second-grade departments. Convertibles sharply lower along with stocks. Industrial bonds soft, though oils held most of recent gains. Public utilities declined, varying from modest losses in AT&T and NY Edison to sharp reaction in Utilities Light & Power. Foreign bonds reactionary, with liquidation turning “acute” toward end of week; drops of 5 - 10 points frequent; record lows hit in German issues; most S. American bonds suffered severe declines. Among the few bright spots were a firm tone in US govts. and sale of NY State bonds at record low yield. Sterling fell on Friday and Saturday, with forward months particularly weak; decline attributed to nervousness over possible return to power by Labor, flight of both foreign and domestic capital, and further gold losses by Bank of England. Holland took several large gold shipments from England, as well as a shipment of $550,000 from NY Friday, the first to Amsterdam in several years. Stocks in Paris experienced a bad week, “requiring banking support Thursday and Friday to prevent panicky conditions.” Stocks in Berlin suffered considerable losses on the week, though turnover was light. Money markets dull; Fed. Reserve statements showed small decline in currency circulation, possibly marking “an end, at least for the time being, of the spectacular hoarding of currency that has marked the past weeks.” Monetary gold holdings rose to a new record high of $5.015B. Acceptances outstanding fell during August to the lowest level in 3 years. Grain prices showed better resistance, with wheat moving slightly up and corn fairly steady. However, cotton sagged steadily to new 32-year lows even as “various proposals to remedy the cotton situation were being considered”; Oct. cotton fell below 6 1/2 cents. Copper fell to new record low of 7 cents/pound, 2 cents below the record previous to 1931. British Treasury reportedly withdrew its support peg in sterling Saturday after several weeks of maintaining it. It was also reported that the recent US credit was substantially drawn on that day, after two previous drawings of 20%. Speculators rushing to short sterling found NY banks refusing to accept their orders. However, sterling still broke sharply to $4.84 1/2 before support from NY banks rallied it to $4.85 at the close. Forward quotes are at discounts as high as 3 cents/month, with 90-day delivery at $4.75. Bank of England shipped 907,543 sterling in gold bars to Holland. Support for sterling in Paris has caused heavy selling of francs in markets where sterling isn't being supported; francs weaker against other European currencies and gold exports from France possible. Commerce Dept. reports European unemployment, after reaching record levels over the winter, had a disappointing spring recovery, leaving the June level at a record for that time of year. Even higher unemployment is expected this winter. Treasury deficit for July 1 - Sept. 17 was $349.2M vs. $116.2M in 1930; income tax receipts were $243.7M vs. $335.3M; however, customs receipts rose to $92.0M vs. $77.2M. Texas Railroad Commission cuts allowable production per well in East Texas to 185 barrels/day; this is expected to cut the area's production to about 370,000 barrels/day from 425,000. Oil prices strengthened, with almost all major buyers paying 68 cents/barrel. Radical actions in form of martial law shutdown in East Texas and Oklahoma oil fields were unprecedented. However, they are believed to have improved oil company results for the third quarter from the “demoralized” condition prevailing previously, with “production running riot in East Texas” and midcontinent oil prices falling as low as 10 - 22 cents/barrel. BLS reports employment in Aug. fell 0.3% from July; wholesale commodity price index 70.2 in Aug., up from 70.0 in July but down from 84.0 in Aug. 1930; index of retail food prices in 51 cities 119.7 on Aug. 15 vs. 119.0 on July 15 and 143.7 on Aug. 15, 1930. ICC will hear final oral arguments in 15% freight rate increase case today; decision likely in mid-October. French govt. takes control of the French Line (France's leading shipper), increases annual subsidy to 30M francs from 4M. Brazil says will stop making interest payments on external debt pending negotiations with creditors. 1931 Commerce Yearbook reports 1930 output of manufacturing industries about 19% under the record set in 1929, 13% less than the 1925-29 average, but 43% over 1921; sharpest decline was in auto production. Fisher's wholesale commodity index rose 0.1 to 69.0, following three weeks of stability at postwar low of 68.9. One of my favorite things about doing this blog has been coming across the amazing performers and artists of the time, many of whom are more or less forgotten these days. In many cases, I've found that good footage is available on Youtube or other internet video sites. So, I'm going to try to put together a more organized collection presenting some of these Forgotten Geniuses for your rediscovery. 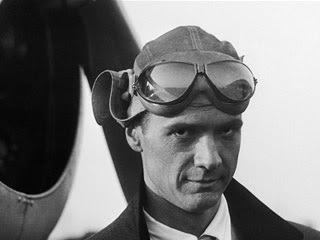 Our first Forgotten Genius is (drumroll) ... Howard Hughes. Of course, Howard Hughes isn't exactly forgotten today, but I'd venture to guess that the vast majority of people know him mainly as a crazy billionaire. It's not as generally remembered that he was a great movie producer and director. One of his most remarkable efforts is the World War I aviation film Hell's Angels, which was released in Oct. 1930 after about three years of production at a cost of close to $4M (in 1930 dollars - the advertisements for the movie claim it's “The First Multi-Million Dollar Talking Film”, and some sources credit it as the highest-budget film until Gone With the Wind, though others say Fritz Lang's Metropolis was more costly). Hughes shot 560 hours of film, so 99.64% of the film shot wound up on the cutting room floor - an off-the-charts ratio for a dramatic (non-documentary) movie, this set a record that probably still stands. The initial silent version of the film was previewed in March of 1929. However, in the interim sound technology had come along and Hughes eventually decided to redo the whole thing as a talkie. 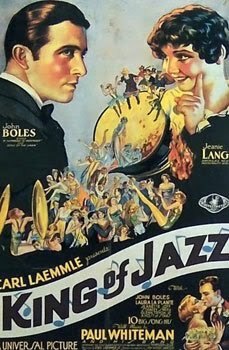 This involved not only scrapping much of the already shot film but paying off and dismissing the original female lead (Greta Nissen) because her strong Norwegian accent made her implausible in the part; Hughes instead settled on a 19-year old Jean Harlow, in what's generally considered her “big break.” (Strangely, the film contains the only surviving color footage of Harlow). Hughes used about 90 planes, 130 pilots, and 20,000 extras on the film. He bought many authentic World War I fighter planes and hired World War pilots to fly in the aerial scenes. However, one of the scenes Hughes wanted to shoot was so dangerous that the pilots refused to do it, warning it would cause a crash. Hughes insisted on shooting the scene, wound up flying the plane himself, and did crash it as warned, though he escaped with only minor injuries. Unfortunately, three other pilots and a mechanic were not as lucky, losing their lives in three other accidents during the film's production. Hughes appears to have gone through a number of directors early in production (various sources mention Marshall Neilan, Luther Reed, and Edmund Goulding). He then decided to direct much of the film himself, though he used James Whale for the talking scenes. (This was Whale's directorial debut, though the film took so long to complete that Whale's second movie - Journey's End - was released first; Whale, of course, went on to direct Frankenstein and other classics). Curiously, I think it's the talking scenes in this movie that feel sort of awkward and stilted today (maybe partly due to the midstream change to sound). The aerial scenes, presumably directed by Hughes, still pack a wallop, and none more so than the beautiful and haunting sequence below in which a German Zeppelin tries to bomb London, and then is chased by British fighters. Play "Hell's Angels Zeppelin scene" on Vimeo. Play "Hell's Angels clip" on Youtube. Play "Hell's Angels premiere" on Youtube. And in this one you get to hear a bit of what the stars were saying on the red carpet (including Dolores Del Rio and Buster Keaton), followed by the traditional guy-in-a-suit-reading-congratulatory-telegrams-the-morning-after. Play "Hell's Angels trailer" on Youtube. Play "Scarface final scene" on Youtube.